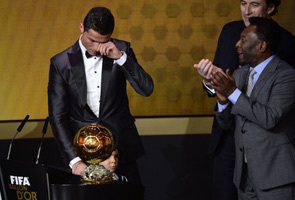 PARIS: When Portugal star Cristiano Ronaldo was awarded last year's Ballon d'Or in recognition of his dazzling achievements over the course of 2013 he naturally had plenty of reason to celebrate although one could forgive him for feeling apprehensive about his country's hopes at the World Cup in Brazil. Portugal will go the tournament as dark horses heavily reliant on their captain and talisman Ronaldo, who will need to defy the odds if he is to avoid becoming another footnote in a cautionary tale. Since the inception of the Ballon d'Or, conceived by France Football magazine in 1956 to recognise Europe, and then latterly, the world's most outstanding player each year, of the 14 players in possession of the prize heading into a World Cup none have achieved ultimate success on the global stage. Granted the facts are skewed to an extent given only European players were eligible for the prize prior to 1995, ruling out the likes of three-time World Cup winner Pele and Diego Maradona, who was central to Argentina's 1986 triumph, but that still leaves some of the game's most decorated players who have fallen short. Take Barcelona star Lionel Messi, who won the first of his four consecutive Ballon d'Or awards in 2009, for example. An Argentina side with an embarrassment of attacking riches breezed through to the quarter-finals at the 2010 World Cup in South Africa despite Messi not contributing a single goal. However, when they needed him most he was unable to deliver as Maradona's shellshocked Argentine team were ruthlessly torn apart by Germany 4-0 in the last eight. That provided merely just the latest chapter of a World Cup campaign ending in disappointment for the world's leading player, a story that dates back to 1957 Ballon d'Or recipient and Real Madrid legend Alfredo Di Stefano. For Argentine-born Di Stefano, who acquired Spanish citizenship in time for the 1958 qualifiers despite previously representing his homeland as well as Colombia, his adopted nation fell short in their quest to reach the finals leaving one of the world's greatest players to ultimately finish his career without ever appearing at the World Cup. The only other time the reigning European Footballer of the Year, as the award was also referred to prior to merging with the FIFA World Player of the Year accolade in 2010 to become the FIFA Ballon d'Or, didn't appear at the global showcase was in 1978 when Danish striker Allan Simonsen, a European Cup finalist with Borussia Moenchengladbach the previous year, saw his nation's hopes dashed in qualifying. However, there have been five teams featuring the reigning Ballon d'Or winner to reach the final. Perhaps no player has come quite as close nor suffered a fate so cruel as the one that befell Italy's Roberto Baggio at USA '94. Baggio netted all five of his goals in the knockout rounds, including two in the semi-finals against Bulgaria, to send the Azzurri into the final against Brazil. But after a goalless 120 minutes in Pasadena, the Juventus forward blazed his penalty over the bar in the shootout to hand Brazil their fourth world title. Before that Johan Cruyff and the Dutch appeared most likely to put an end to the curse at the 1974 tournament. The Netherlands and their revolutionary brand of "Total Football" conquered all before them on their way to the final and seemed destined to be crowned champions after an early penalty put them ahead against West Germany. However, the Dutch came unstuck and would lose 2-1. Italy's Gianna Rivera (1970), West Germany striker Karl-Heinz Rummenigge (1982) and Brazilian forward Ronaldo (1998) also fell a win shy of the Ballon d'Or-World Cup double. Three-time reigning European Footballer of the Year Michel Platini saw his France side knocked out in the last four of the 1986 edition, while Eusebio, despite a sparkling performance at the 1966 tournament where he scored nine times to claim the Golden Boot, was part of the Portugal side dumped out by hosts England in the semi-finals. 2001 award winner Michael Owen could only help England as far as the quarter-finals the following year before they were dispatched by Brazil, while a sub-par Ronaldinho was helpless to save his country from a last-eight exit the following tournament. The Netherlands' Marco van Basten (1990) and Italy's Omar Sivori (1962) fared even worse, also succumbing to the mysterious jinx of the Ballon d'Or.